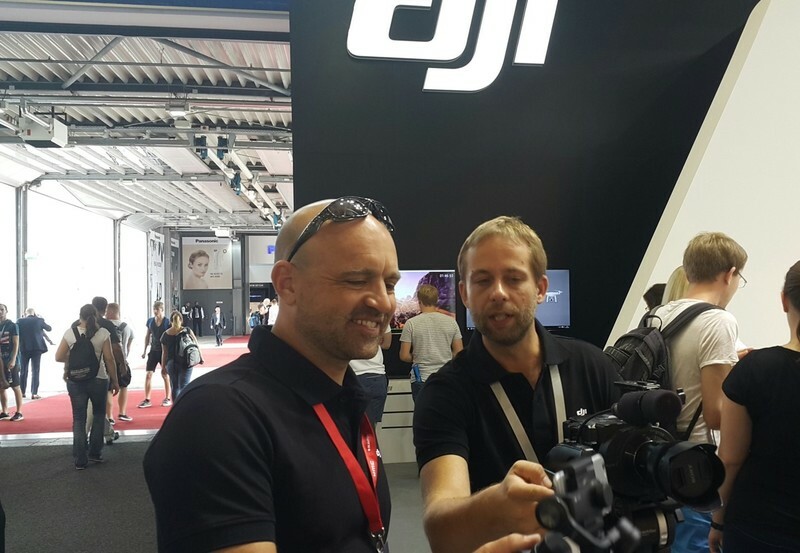 Meet Dylan Baldwin, whose creativity and passion for DJI products won him the chance to be our DJI Specialist during this year’s IFA tradeshow in Berlin. With a long history in the film industry, Dylan fit right in at IFA and, with the new DJI Osmo Mobile in hand, excelled as a visual storyteller. That’s what a DJI Specialist does – capture the best moments at tech-related events and relay it to you at home. Baldwin got started early in filmmaking. He was a child actor and continued acting until his mid-twenties, including stage plays and TV dramas like East Enders. It was on those sets that he got an education that has carried over into his new professional career. 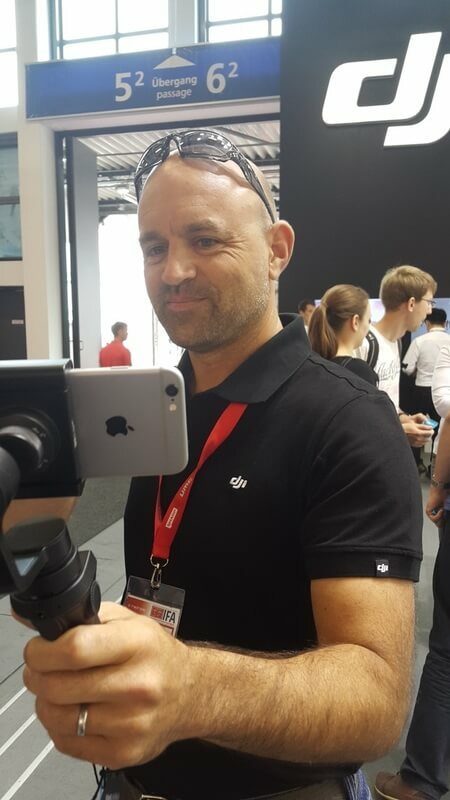 On the floor of IFA, Baldwin has seldom been without one of DJI’s new smart motion cameras – the Osmo Mobile -- in his hand as he shoots stills and high-resolution video to document the event. Baldwin is a 44-year old father of two who set up his company aerial film and media services company, ikopta Ltd., just a year ago. The idea of providing aerial imaging services to other companies in his local Norwich came after the first time he tried flying a drone – the original DJI Phantom, borrowed from a friend. After seeing how it performed as an inspection tool, his next professional move was obvious. “I found it incredibly easy, but where most guys just want to see how high and far you can go, I wanted to see how you could be more creative about it,” Baldwin said, who today does everything from recovering lost dogs in search and rescue missions to shooting for the BBC. Still, making that obvious move took some time. The first step on his new path was to convince the renewable energy company he was working at at the time to purchase a DJI Inspire 1. Last year was the perfect time for the next step, and Baldwin took the chance to secure his U.K. pilot certification and set up ikopta. Today, inspection and search and rescue are his bread and butter but he lives for new and challenging jobs that tap into his natural creativity and his past as an actor. Switching from aerial to handheld was a new experience, but not a difficult step. “It’s a different tool for a different use. I’ve loved it. I love the flexibility and the ability to transmit live, yet you’ve got the cinematic creativity of the gimbal,” commented Baldwin on the new type of imaging tool he was working with. Following his experience as a DJI Specialist, Baldwin says he’ll remain a big DJI fan and professional user because of the diverse range of the company’s products.